The Morrison Grants team is highly experience in writing, analysis, and project management, all critical skills to a successful grant proposal. In addition, they can help with grant administration as well as the management and execution of many types of grant funded projects. Learn more about our Grant services here. Toni Scott, M.S., directs our grant services, conducts research, provides project management, and writes competitive state and federal grant proposals for Morrison & Company clients in the areas of marketing, risk management, and alternative energy, serving clients in food, agribusiness, manufacturing, production agriculture, processing, and marketing. She also conducts strategic planning projects, working with client Boards and management to develop and implement long- and short-term strategic plans. Toni also assists with executive recruitment on behalf of Morrison clients and directs Morrison & Company's external communications and industry outreach. Toni holds a bachelor’s degree in political science and agriculture business from California State University, Chico, and a master’s degree in print journalism from Boston University. She previously worked for the Chico Enterprise-Record, a daily newspaper, for three years, covering city government and stories related to business, agriculture, education, and public safety. Toni is the Chair of the City of Chico Planning Commission and past Chair of the Board for the Chico Chamber of Commerce. She is the past President of the Chico Chamber of Commerce Young Professionals Organization, a member of the Butte County Farm Bureau Board of Directors, a founding director of the Butte Agriculture Foundation, past chair of the Butte County Young Farmers and Ranchers, a former appointed member of the City of Chico Sustainability Task Force and a former appointed member of the Butte County Library Advisory Board. She is a graduate of the California Farm Bureau Federation's Leadership Farm Bureau program and a contributing business columnist for the Chico News and Review. Toni was named Chico's Rising Star in 2012 by the Chico Chamber of Commerce. She and her colleagues won the top ”Awards for Excellence in Health Care Journalism" honor from the national Association of Health Care Journalists for her work on a four-part investigative report in 2010. She also received the 2009 Butte County Farm Bureau Media Partner of the Year award in recognition of her work covering agricultural issues. In college, Toni was a member of Sigma Alpha, a national professional agriculture sorority, and worked for the CSU Chico College of Agriculture as a public information intern. 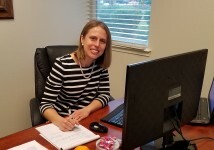 Consultant Hilary Tricerri works with Morrison clients in the areas of grant writing, grant administration, project management, and with our People Solutions team assisting clients in their recruiting needs. She brings her talent and background in writing and communications to serve our clients in seeking competitive grant funding through USDA, CDFA and other grant programs. Additionally, she brings her experience in communication to build rapport and trust with clients and recruitment candidates alike to ensure both a great skill and cultural fit. Prior to her role at Morrison, Hilary’s experience includes seven years as Associate Director with The International Foundation in the Washington DC area, whose mission is to fund and support US-based non-profit organizations that partner with poor communities in the developing world. In her position she worked closely with international leaders in government, business, and the non-profit sector to manage and execute projects and events. Before joining The International Foundation she served as Executive Assistant to the CEO and COO at International Justice Mission (IJM), a global organization that includes lawyers, investigators, social workers, and other professionals at work through 17 field offices and based in Washington DC. She was responsible for moving executive level projects and initiatives forward, assisting in cross-department coordination as well as communication and coordination with external stakeholders. Hilary has been responsible for correspondence with, and event planning for, members of the US Congress and other high-ranking governmental officials, and has drafted testimony for Congressional hearings. She has developed and managed small and large teams, organizational projects and communication, as well as marketing materials and presentations. Hilary holds a Bachelor of Arts degree in Political Science from Westmont College in Santa Barbara, California. She is active in the local community and has served as Director of Missions at Chico’s Bidwell Presbyterian Church where she managed communication (e.g., print, digital, video) regarding opportunities to engage locally and internationally, served on the senior staff leadership team, and as a ministry coordinator. She is currently the President of the Nord Country School Board of Directors.